Hold on to your plastic safety helmets, fasten your fantastical seat belts, you are in for an epic cosmic ride! Route Dash Niner: Part II, by Re:group Performance Collective, picks up where their 2016 Part I left off. A fast initial recap of Part I’s Earthbound press conference heralds the group’s intention to launch an intergalactic investigation to find the source of a mysterious signal emanating from “the deepest corner of the universe,” somewhere in the vicinity of Absconsus. Despite the fake media briefing, when the lights go out for the start of Part II, Australia’s first interstellar mission has already departed and the “brave souls” bade a fond farewell to seek contact with alien life forms. Aboard their transport vessel, Hat-Thrower, the valiant crew surf the celestial slipstream of Route 9 toward an uncertain destiny. They stretch the umbilicus of live video feedback to the blue planet for as long as possible and, as reception fades, they keep filming nonetheless. 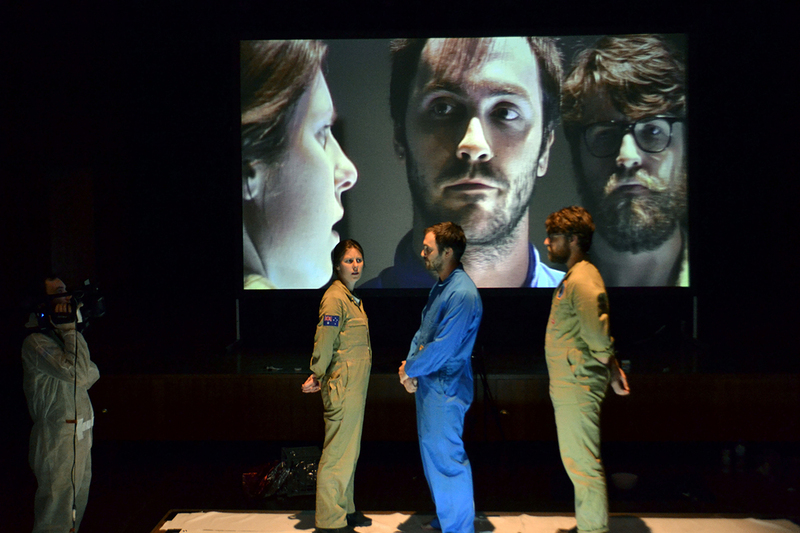 The pacey action of preparing the scenographic tricks, and then shooting live film onstage, is what drives the quirky spatial choreography of this inventive and deftly handled work. Successfully creating a live performance experience while focused on the camera is no easy feat, but the clunky playfulness the performers employ is what makes this work such a delight. 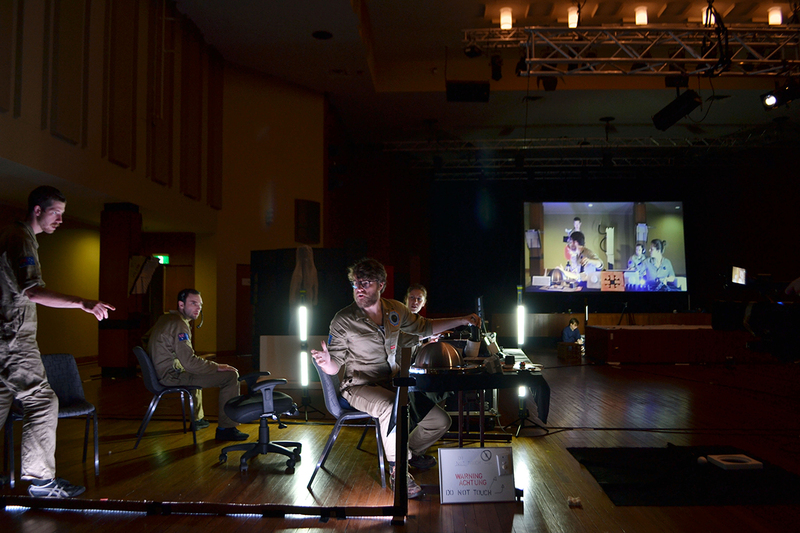 A seemingly random scattering of tables, monitors, shonky modules made of cardboard and styrofoam and a staircase going nowhere transform the wood panelled Wollongong Town Hall into something resembling an early set from Lost in Space. As Hat-Thrower ventures beyond contact with Earth, the question is, can this foolhardy group of space cadets really “trust the universe to take care” of them. Indeed, who or what can they trust at all? Twelve months into the voyage it is the task of Mark (Rogers), a bearded human-like-machine (part nerd, part spooky hipster embodiment of HAL) to wake the crew, somewhat early, from cryogenic slumber. One of those woken, Carly (Young) is a drily downbeat version of Princess Leia. Together, across the breakfast table, they need to deal with some unexpected technical “anomalies” and the impending threat of collision with a random neutron ball — a wobbling maquette made of aluminium foil. Hurtling at great speed among comets and arguments, crunching numbers, obscure formulae, floating breakfast cereal and existential angst, the cast deftly slide between tasks as paranoid astronauts and film crew. Employing “acceleration” and a “bypass,” they narrowly miss a suction event into the oblivion of a black hole. Dizzying sequences and scene cuts abound as live camera feed is projected onto multiple projection screens. Instead of CGI animation Re:group makes hilarious and inventive use of toy spaceships moved by hand across black cloth to simulate space cam footage, creating the impression of an extensive craft by filming in corridors, broom closets and barely concealed behind pillars. Sitting near the control desk I could see how dextrous the vision switching needs to be and how tight the sequencing of action. At times it’s breathtakingly fast and very impressive for this group of distinguished University of Wollongong grads, who claim never to have made a film before. In the few years since university they have however made some memorable theatre across a number of configurations and artist collectives. These are fresh and unafraid voices. Re:group gorges with relish on the innate human desire to scout the stars, to hitchhike across the pearly galaxy. They take the piss, they re-invent. They manage convincing scene shifts as one brave soul must make the narratively inevitable excursion outside the craft to repair the engine — with a rubber hose and a hammer. Dripping heavily with irreverent borrowings from and spoof-like tributes to all the sci-fi movie blockbusters, Route Dash Niner Part II conjures moments of suspense and mystery as well as some pathos associated with the loneliness of the long-distance voyager, the abject ennui of one-way travel into the as yet unknowable. The long muffled goodbye. Can you hear me Major Tom…? The next question is, when will we see Route Dash Niner: Parts I & II staged as an epic double, on tour or programmed into a major festival? Don’t miss the next smoking orbit of this eccentric craft. No doubt, they’ll be back. 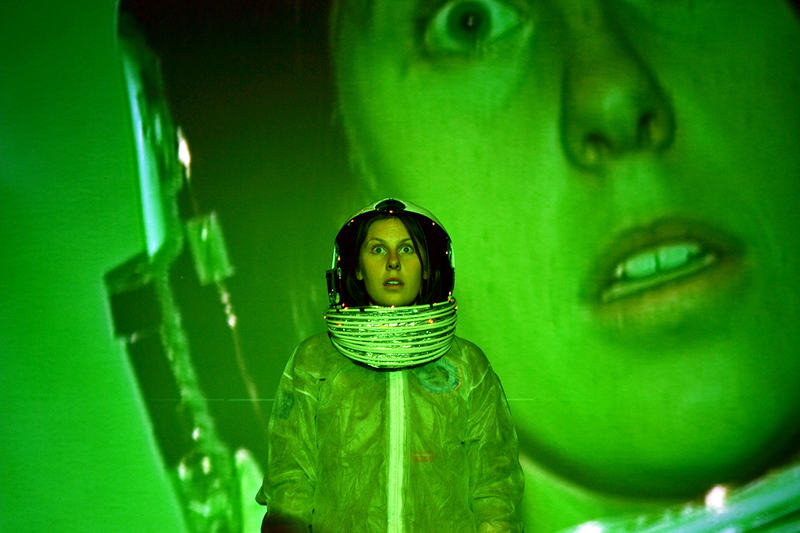 Read our review of Lovely, the 2015 work by Re:group Performance Collective.